Once. Just once did I make the mistake of buying holiday wrapping paper full price. 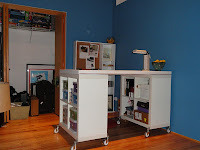 I was wooed by being new to Chicago and having a Crate and Barrel just around the corner. $8 (and only covering three or four normal sized presents) later, I learned my lesson. Now, I am not saying go to the Dollar Store and pay next to nothing for a huge roll of super thin paper that tears at the slightest sharp corner. Here’s the plan: head to your favorite Target, Pier 1, World Market or Crate and Barrel the day after Christmas and don’t settle for less than 50% off. 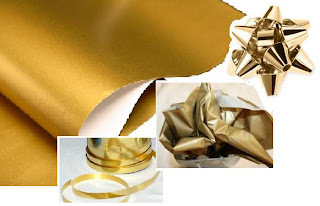 Grab yourself a few rolls . . .along with ornaments and stockings . . .and cards and decorations. . .and serving platters and candlesticks. 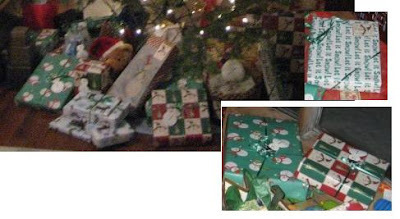 . .
Martha Stewart and her ilk always have amazing ideas for ornately decorating your gifts: “Attach a six foot peacock feather, cover the entire gift in glitter.” I toe the line on going too over the top with my wrapping because, after all, I know where it is going to end up (that big garbage bag in the middle of the room Christmas morning). I do like to have some fun, however, with an annual wrapping paper theme. Bear with me as I try to re-create some of these themes of Christmas’ past – my documentation of every little thing I do did not start until this year so my photo archive is sorely lacking. I picked up a few paper mache boxes in different shapes from Jo-Ann Fabrics. No wrapping needed for these, just some green and tan raffia ribbon. 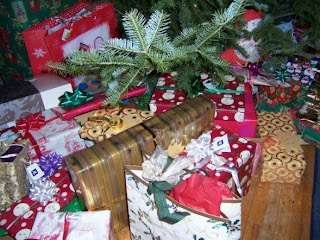 The wrapping paper were all dark greens, with glittery tree-shaped tags attached. Time to utilize the “attach an ornament to the ribbon” trick with wooden trees, berries and other northwoods friends. This was one of the first results of Day-After-Christmas Target Inspiration. They had a great set of blue gift wrapping material so I stocked up and also picked up some different shades from Crate and Barrel. The thick felt accents on one roll were oh-so-luxe, but take note that they can be a bit of a headache to keep taped together. Blue and white ribbons and tissue paper, a few bright gift bags and cheapie snowflake ornament adornments round out the theme. Definitely not what you might expect under the Christmas tree, this theme was inspired by a bold set of papers found at Pier 1. 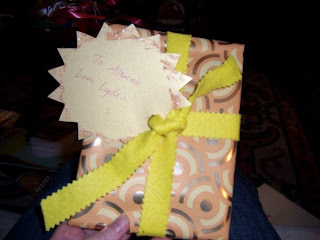 I made the gift tags out of shiny cardstock and glitter. Just add orange and yellow tissue paper and bright ribbons in a few shades and unexpected textures – like this thick felt. The most traditional theme so far, I bought out the snowman themed paper and gift tags. Green, red and white ribbons and some cute gift bags. One roll of paper was double sided, allowing you to choose either “Let it Snow” or snowmen for the recipient. A stuffed snowman gift card holder was also added to the bunch. 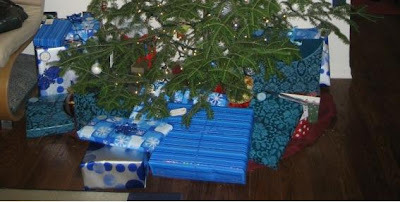 One reason I like getting paper that is not super Christmas-y is so I can use the extra pieces throughout the year – blue wrapping paper works just as well in mid-July! I did end up having quite a bit of snowman paper left over so I may be – gasp! – repeating the theme this year. Don’t be disappointed in me. I love themed wrapping paper! Your 'natural' ideas are too cute! !